Steve Jobs- "Have the courage to follow your heart and intuition. They somehow already know what you truly want to become. Everything else is secondary." This revolution, the information revolution, is a revolution of free energy as well, but of another kind: free intellectual energy. But good PR educates people. That’s all it is. You can’t con people in this business. The products speak for themselves. The Web is not going to change the world, certainly not in the next 10 years. It’s going to augment the world. And once you’re in this Web-augmented space, you’re going to see that democratization takes place. It’s in Apple’s DNA that technology alone is not enough – it’s technology married with liberal arts, married with the humanities, that yields us the result that makes our heart sing, and nowhere is that more true than in these post-PC devices. There’s an old Wayne Gretzky quote that I love: “I skate to where the puck is going to be, not where it has been.” And we’ve always tried to do that at Apple. Since the very, very beginning. And we always will. We’ve had one of these before, when the dot-com bubble burst. What I told our company was that we were just going to invest our way through the downturn, that we weren’t going to lay off people, that we’d taken a tremendous amount of effort to get them into Apple in the first place — the last thing we were going to do is lay them off. If you don´´t love it you´´re going to fail. The minute I dropped out of college I could stop taking the required classes that didn’t interest me, and begin dropping in on the ones that looked interesting. Woz and I started Apple in my parents’ garage when I was 20. We worked hard, and in 10 years Apple had grown from just the two of us in a garage into a $2 billion company with over 4,000 employees. For the past 33 years, I have looked in the mirror every morning and asked myself: “If today were the last day of my life, would I want to do what I am about to do today?” And whenever the answer has been ‘No’ for too many days in a row, I know I need to change something. Apple’s goal isn’t to make money. Our goal is to design and develop and bring to market good products… We trust as a consequence of that, people will like them, and as another consequence, we’ll make some money. But we’re really clear about what our goals are. We did not enter the search business. Google entered the phone business. Make no mistake they want to kill the iPhone. We won’t let them. I thought deeply about this. I ended up concluding that the worst thing that could possibly happen as we get big and as we get a little more influence in the world is if we change our core values and start letting it slide, I can’t do that. I’d rather quit. I was worth over $1 million when I was 23, and over $10 million when I was 24, and over $100 million when I was 25, and it wasn’t that important because I never did it for the money. I mean, some people say, “Oh, God, if Steve Jobs got run over by a bus, Apple would be in trouble.” And, you know, I think it wouldn’t be a party, but there are really capable people at Apple. It is hard to think that a $2 billion company with 4,300-plus people couldn’t compete with six people in blue jeans. Nobody has tried to swallow us since I’ve been here. I think they are afraid how we would taste. We don’t believe it’s possible to protect digital content … What’s new is this amazingly efficient distribution system for stolen property called the Internet — and no one’s gonna shut down the Internet. And it only takes one stolen copy to be on the Internet. And the way we expressed it to them is: Pick one lock — open every door. It only takes one person to pick a lock. Worst case: Somebody just takes the analog outputs of their CD player and rerecords it — puts it on the Internet. You’ll never stop that. So what you have to do is compete with it. It wasn’t that Microsoft was so brilliant or clever in copying the Mac, it’s that the Mac was a sitting duck for 10 years. That’s Apple’s problem: Their differentiation evaporated. Because I’m the CEO, and I think it can be done. Steve Jobs sista ord omgiven av sin syster, sina barn, och sin livspartner. 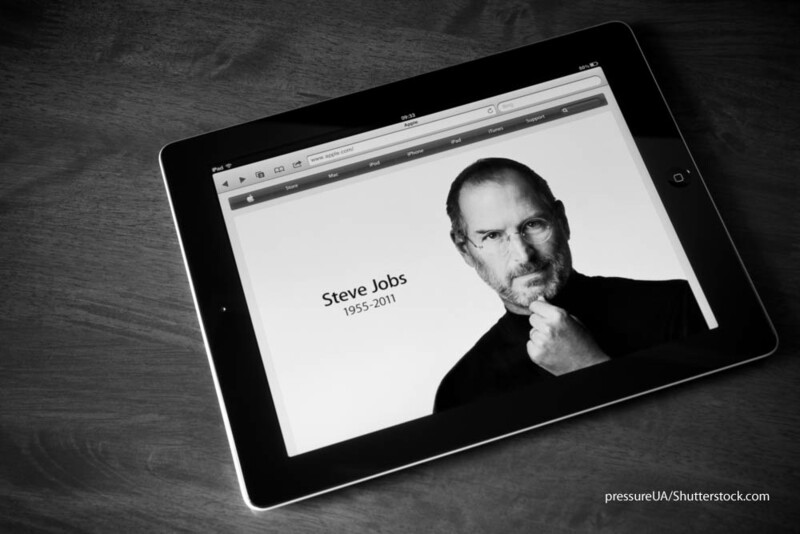 Steve Jobs avled i sitt hem den 5:e oktober 2011. RIP.